Irwin Gootnick, M.D. (San Francisco) - Book Appointment Online! 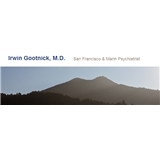 Dr. Irwin Gootnick is a San Francisco & Marin psychiatrist who was featured on The Oprah Winfrey Show. Dr. Gootnick is a board-certified psychiatrist and has been practicing psychiatry and psychotherapy for over 40 years. He has received many awards for the teaching of psychotherapy to psychiatrists in training as well as those in practice. Dr. Gootnick evaluates the underlying causes of patient symptoms and is expert at helping to solve them.